Since my last update, I've managed to clear my head a bit, mostly by reading great books and coloring. Not to mention some time in the pool and some great food. But right now...just the books. 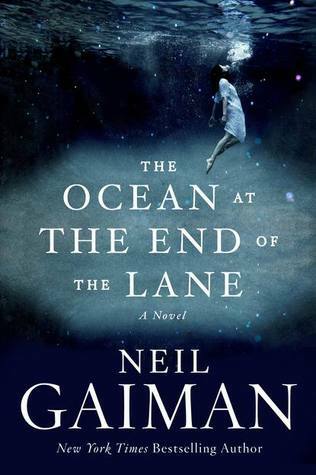 I rarely re-read, but for some reason The Ocean at the End of the Lane by Neil Gaiman was calling to me last week. I took three evenings to read it which is fairly slow since this is one of those gobble-up-the-goodness type books. I originally read it in one sitting when it first came out, but it was so nice to revisit this favorite with a little more eye toward the detail. It was just as good, if not better, upon re-reading. Just as magical and tearful as the first time. Next up was The Beautiful Bureaucrat by Helen Phillips. Try typing Beautiful Bureaucrat a couple of times, and tell me how difficult that is. My fingers want no part of it. I'm glad to report that it was much easier to read than it is to type. This mysterious, haunting, experimental novella was a fun one. Another book that could've been enjoyed in one gulp. Finally, an instantaneous favorite. 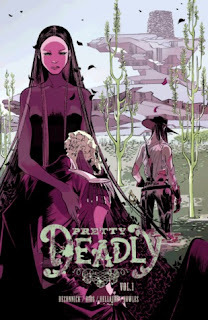 Pretty Deadly Volume 1: The Shrike by Kelly Sue DeConnick and Emma Rios was simply glorious. I've heard plenty of people say that this is one of the finest comics around, and I'm just sorry I waited this long to read it. Part western, part myth, part folktale, it's pitch perfect. I'll have to write a full review if I'm going to get this gushing out of my system, but just to give you a little peek...it's about death's vengeful daughter. Hell yeah! What are your favorite reads lately? 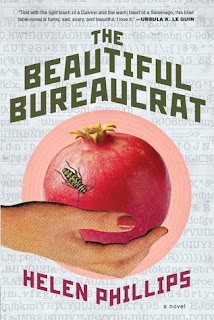 The Beautiful Bureaucrat was such a trip for me - I'm definitely going to be reading it again before it's published. Glad to hear you've had a few good ones in a row! Trippy is a good word for it. I kept expecting to be really let down by the end, but I actually wasn't, which was a great surprise. Here's hoping I can keep the streak going! I am deep into Atlas Shrugged now and finding it hard to read other books along with it, but I must because my review list is long and I messed up and said yes to too many this month. You are brave. I don't think I could do Rand, but The Fountainhead kind of ruined me for trying. I'd pick up The Beautiful Bureaucrat just for the cover. I still need to read that Gaiman book - its sitting on my shelf waiting to be picked up. I've been thinking of rereading A Confederacy of Dunces, Cat's Cradle, and Beyond the Great Indoors - some of my favorite books-but have been putting it off. Maybe its time to do it. I have The Beautiful Bureaucrat and am not excited to read it after reading how much you liked it. Rereading can be so much fun, but I have to really feel the pull to pick up a book I've already read. I hope you enjoy The Ocean at the End of the Lane when you get to it! It's beautiful. I've been thinking about you, Andi. It's good to hear that you were able to clear your head. I've been thinking about you, too!!!! Sending hugs your way. I really need to read The Ocean at the End of the Lane! Finished a very short book today, Bonjour Tristesse, for Paris in July - so good. It's so so so so goooood! And I do love a short book. Will look up Bonjour Tristesse! Andi glad to hear you are doing better! Still have not read The Ocean book. I know... what is taking me so long! Now I want to hear more about the coloring part. Like coloring books? I have just gotten into coloring books and it's so much fun and best of all, relaxing! Hope you have a great week. Hey, it's a super quick read if you get in the mood for one of those! :) And yes, coloring books! I'm having such fun with them. It's great to focus my attention on something not stressful. I'm so behind on my Gaiman reading. Time to pick that one up...well as soon as I finish the three books I have going. Oooh, which books do you have going? I'm glad things got a little better in your week. I don't tend to reread a lot, but I will read portions of favorite books once in a while. There's just something really good for the soul about it! Definitely! And thank you. I don't re-read very often either, but that was one was calling to me so strongly. I think there were some messages there that I needed. this Gaiman is also so good in audio, read by himself! Ooh, I do love his voice! I loved The Ocean at the End of the Lane on audio. Gaiman is amazing! Hope to read it again in print format one of these days. I'm currently reading The Rosie Effect (the sequel to The Rosie Project). It's good, but I'm not hooked yet. Too many summer distractions and little time to read. I'll get there, though. Glad to hear you're doing better. I've been thinking of you, friend! To my never ending shame I have to say that I've never read Gaiman. It feels like I should turn in my book lover's card! ;) I have The Beautiful Bureaucrat on my shelf and I keep meaning to get to it. I will, soon! WHAT??? I have to admit, I have a hit and miss relationship with this work. I seem to be in a groove now, but I haven't loved some of this work...American Gods for example. I love rereading Gaiman novels. They never cease to unveil hidden secrets when you do. The Beautiful Bureaucrat is on my list of books to buy next. Both Jen and now you have loved it, so I know that means I will too. Because you two are HORRIBLE for my TBR list. Loved The Ocean at the End of the Lane. There are so many layers you will always find something new. I copied The Beautiful Bureaucrat from your writing as it indeed looks like a real pain to type ;) Looks like a great read though. I just did a re-read for The Night Circus. Loved it again! I read BB last week too (and, yes, it's a bear to type...my auto-correct kicks in every time! )...I was thinking "what the F" the entire time and was on the edge of my seat. Kind of trippy..a little Lost in Translation feel. You have GOT to read Neverwhere. Alice in Wonderland retelling set in the London Underground? I've only read it 3 or 4 times so far. I really think it's my favorite Gaiman. I just loooooove it. The Beautiful Bureaucrat is SUPER hard to type. I get it wrong every time. That said, I really enjoyed this "trippy" book. So much fun. I won't jinx is by saying it, but I'm glad you're _______ _____. Ah, thanks for reminding me about coloring! I was trying to think of things I can do by myself that I enjoy and coloring is definitely one of them. You reminded me that I have American Gods sitting on my TBR shelf. And of course, I still need to read Kavalier and Clay! Recent reads that were great: Love May Fail by Matthew Quick, and Queen Sugar by Natalie Baszile. And I've been coloring, which I find really therapeutic and meditative. I really need to check out Ocean again - it went back to the library unread last time! And Bureaucrat was oh so gulpable.